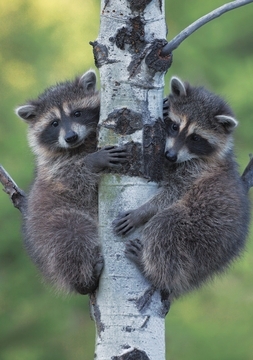 If adaptation is the key to survival, raccoons will be around a very long time. They’ll live just about anywhere—from the country to the city, from the mountains to the shore–and they’ll eat just about anything, including fish, frogs, rodents, insects, fruits and vegetables from your garden, and the pet food and garbage you forgot to lock down. Widespread across nearly all of North America, the raccoon (Procyon lotor) is no more picky when it comes to building a den; favored locations for setting up housekeeping include hollowed-out trees, hollow logs, and—unfortunately for many homeowners—accessible attics.